Thunderstorms likely. A few storms may be severe. High near 75F. Winds SSE at 5 to 10 mph. Chance of rain 100%..
Showers likely and possibly a thunderstorm this evening, then some lingering showers still possible overnight. Low 58F. Winds SSE at 5 to 10 mph. Chance of rain 100%. The Virginia Department of Agriculture confirmed Thursday that the tick was found on horses owned by a local family in Warren County. One horse in particular had a high number of ticks on its face. “The owners were extremely vigilant looking for ticks on their dogs and horses,” said Elaine Lidholm, Director of Communications for the Virginia Department of Agriculture and Consumer Services. The property owner did not want to talk on the record with the Northern Virginia Daily. This is the second confirmed identification of the tick in Virginia. The department confirmed a couple weeks ago that the first Longhorn Tick was found in Albemarle County on a calf. “It is feasible the tick has been here a while and we just did not know it,” she said. “Whenever we find an exotic species, that raises concerns because we don’t know much about them. We have not studied them,” Lidholm said. State officials will work with other partners to determine the extent and significance of this finding, including gathering more information about the tick and possible diseases. “I will probably know more about it in two to three months,” Lindholm said. The species has been associated with tick-borne diseases that have affected humans in Asia, she said. 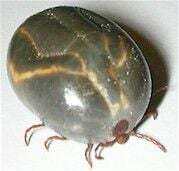 Anyone who notices any unusual ticks they have not seen before or that occur in large numbers on one animal is being urged to notify their local extension agent or they can place the tick in a bag and take it into the agent’s office, she said. Go to https://ext.vt.edu/offices.html to find a local agent. They also offer a list of common ticks found in Virginia. Go to https://pubs.ext.vt.edu/2906/2906-1396/2906-1396.html for help in identifying a tick. Ticks can be found anywhere, even in tall grass, not just on animals or in wooded areas. Lindholm stressed vigilance, such as wearing closed toe shoes, long pants and shirts and checking oneself for ticks when coming inside from outdoors.